Thrive Senior Living celebrates opening the first of several innovative communities in the Washington, DC metro area. Thrive Senior Living has celebrated the grand opening of Tribute at Heritage Village, the first in a portfolio of senior living communities under development across the Washington, DC metro area. Located adjacent to Heritage Hunt, a vibrant 55+ community, Tribute at Heritage Village focuses on resident engagement and connectivity in a unique, resort quality environment. Using a blend of technology and an innovative approach to providing care when it’s needed, Tribute at Heritage Village offers a distinctive experience for a new generation of seniors. The community allows active seniors to maintain an amenity-rich lifestyle as they age in place. It features two dining venues with a bar and wine bar, rooftop terraces, outdoor fireplaces, a spa, salon, fitness center (with senior-focused pneumatic powered equipment), a movie theater, tele-medicine suite for virtual healthcare, walking trails, and much more. The community also features a separate Memory Care neighborhood, providing a fully engaged lifestyle to residents in a secure environment. 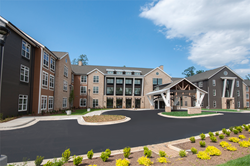 As a result, “This community and its sister communities will be a drastic departure from what most people think of when senior living comes to mind, and will set a new standard for senior living,” said Jeramy Ragsdale, CEO of Thrive Senior Living. Thrive Senior Living’s unique approach uses technology to improve residents’ quality of life, by delivering care more efficiently and with more accountability. Thrive communities utilize an integrated digital health care platform which creates an entirely digital environment; it integrates communication, medication management, electronic health records, and resident care plans, creating a more holistic approach to care. Residents access their apartments using an advanced keyless entry system, eliminating the hassle and difficulty of traditional keys. Thrive’s proprietary wellness program also gives residents, their families, and their physicians a holistic picture of their well-being through the use of technology tools including activity trackers and in-room monitoring systems, which learn each resident’s routine and patterns and can report anomalies and trends. Tribute at Heritage Village is the first of several communities developed and operated by Thrive opening in the DC Metro area, with two currently under construction in Prince William and Loudoun counties and multiple others across the metro area. Thrive has partnered with Palomino Capital, a Dallas/TX-based venture specializing in platform-based growth investments and with Harrison Street Real Estate Capital, an industry leader in senior housing investment. Construction financing was provided by Synovus Bank.